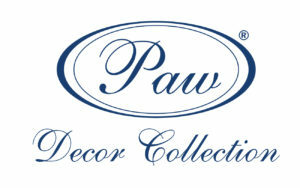 The PAW company has decided to refresh its brand by introducing a new logo and visual identification system. Brand refreshment is to communicate changes that are taking place in our company. We have developed a lot in the recent years: we expanded our production site, we extended our product range and we also gained new market outlets. Re-evaluation of our image highlights these changes. A new logo combines tradition and innovation. Taking into consideration our twenty three years of experience and our years-long activity in the decorative sector – we have left unchanged the caption PAW written in embellished letters and navy blue colour. In order to rejuvenate the brand we decided to ditch ellipsis, we added a square shape and modernized the font in the “Décor Collection” caption. We want to stay true to our values, evoke positive associations while keeping pace with the times. Our new logo symbolizes timelessness in combination with dynamism of action and innovation.